Lesson plan: Is it right to burn money? A great theme for a lesson is one that makes your students sit up and go WTF WAS THAT?! In all my years of trying to provoke my students this is the lesson that has generated most furious debate as it opens up a lot of political issues that people tend to take personally, like money, wealth, value and waste. The lesson should take about 75 minutes and will work well with any class above B2.1/Upper Int. Access to an IWB will facilitate things immensely. Show this film clip, giving students time to identify what’s happening (ans: some people are burning lots of cash). Do a quick straw poll: Who thinks it’s right or wrong? Get them to look up online who the KLF were, specifically how they got the money in the first place. Establish that they were an (unusual) pop band who had huge success. Show a couple of short clips from their videos. Elicit ideas as to why they decided to burn a million pounds. Show this photo to get them started. Get students to look up any articles in which the members of the group explain their reasons for what they did, and share what they find. Using the collocations dictionary ozdic.com, point out that you can, regardless of the legal or moral implications, burn (as in waste) money. Students in pairs list other ways of ‘burning’ money. Share their ideas on the board. Students prepare for a debate. 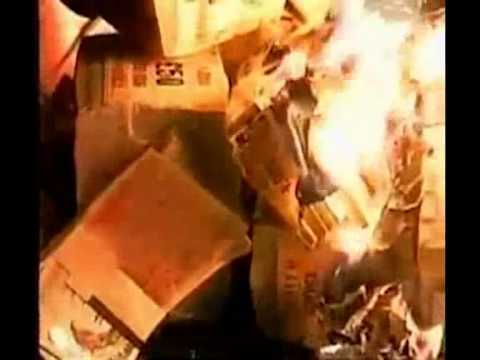 Who thinks the KLF were right or wrong to burn money? Help with arguments on each side. Encourage them to use real and hypothetical examples of similar cases. Hold the debate – you can follow the procedure described here. For homework, get the students to write an IELTS-style essay setting out the main points on each side and giving their own opinion.